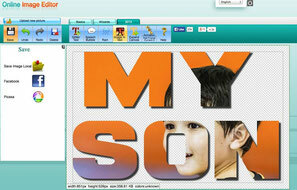 Free online watermark, text and calendar maker, photo resize and convert. If you need a free online image calendar maker, or need to crop a picture and add a text or a watermark to copyright your photos, below are listed many free specialised website, which are also often able to convert your photo RAW in PNG or in JPEG or your DNG in JPEG (whatever kind of photo file format can be converted in JPEG, PNG or GIF). 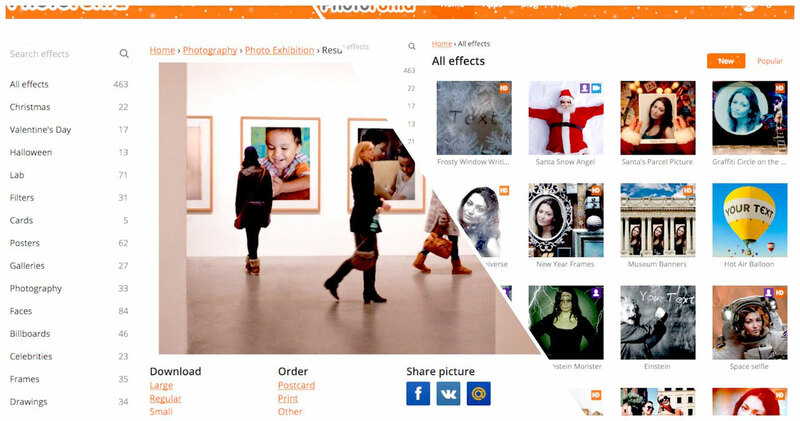 1) PicsTouch free online photo resizer and photo crop. PicsTouch is made to crop and resize your pictures, and if you just need to crop or resize your picture it is pretty straight forward! 2) Raw Pics.io online RAW converter and lite editor. Raw Pics.io is a free online raw converter or JPEG extractor from RAW photo which work directly in your browser, there is no upload on any server! Thanks no need to wait for the raw file to being uploaded. RAW Pics.io allows to convert PDF, CR2, NEF, ARW, ORF, PEF, RAF, DNG and other ﬁles into JPEG, PNG and other formats in your web browser without the need to upload your file online. Raw Pics.io had a strange interpretation of my Canon RAW file as you can see it's all magenta where on my computer this RAW is well exposed and the white balance is well balanced. Now let's speak about this online RAW photo editor : it is far from a good one, first the HSL tool is totally unusable it will select colors that have nothing to do with what you would expect. 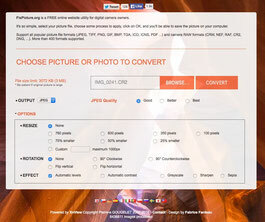 3) FixPicture the pictures converter frustrated by the size. 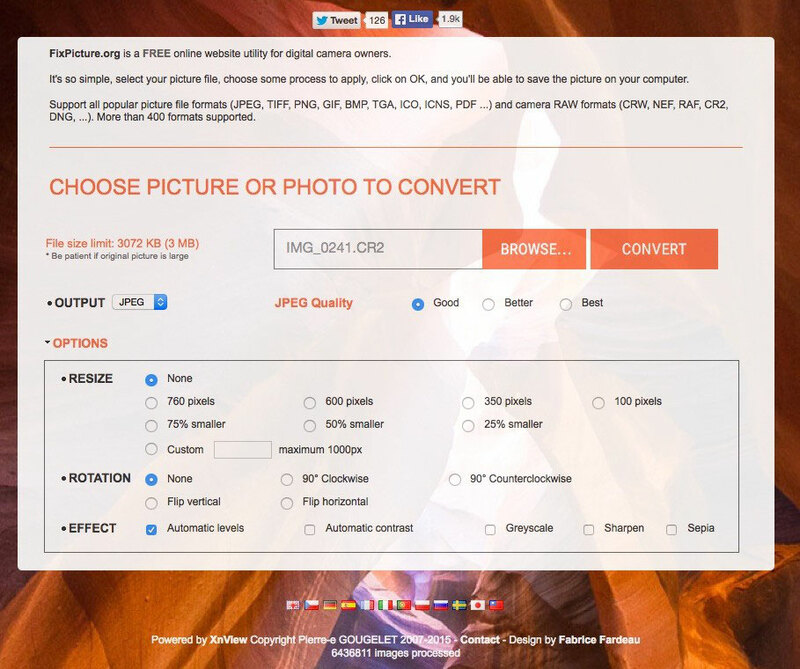 It convert almost any kind or format of pictures in a more usable photo or file like the JPG. It support all popular picture file formats (JPEG, TIFF, PNG, GIF, BMP, TGA, ICO, ICNS, PDF ...) and camera RAW formats (CRW, NEF, RAF, CR2, DNG, ...). Over all it support more than 400 photo or image kind of formats. The only problem is it does not support files bigger than 3Mb and Hum .. how to say, i never saw a RAW file, like my Canon RAW CR2 under ... 20Mb ! 4) Meme generator add a text on a photo get simple. 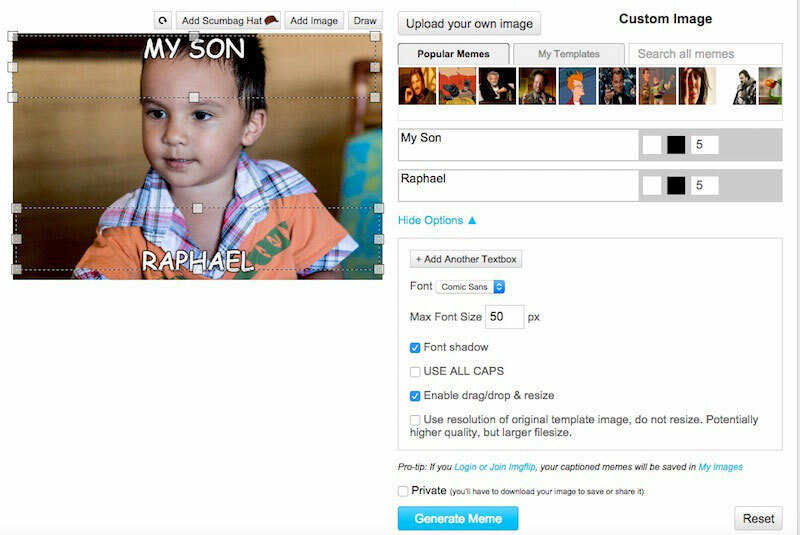 Meme generator which will not overwhelm you, for sure, because it has only 3 fonts and few other options. You need to sign up to download your image once you have written on it, if not you will have access only at an extreme low resolution. You can choose the color of the font, and you can move and resize the writing box. 5) Picresize is a free online picture resizer. 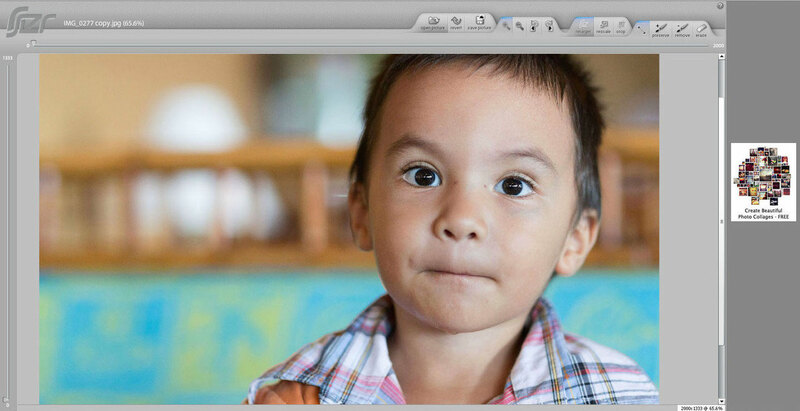 Picresize is a free web based photo and image resizer with a crop option, flip and rotate. 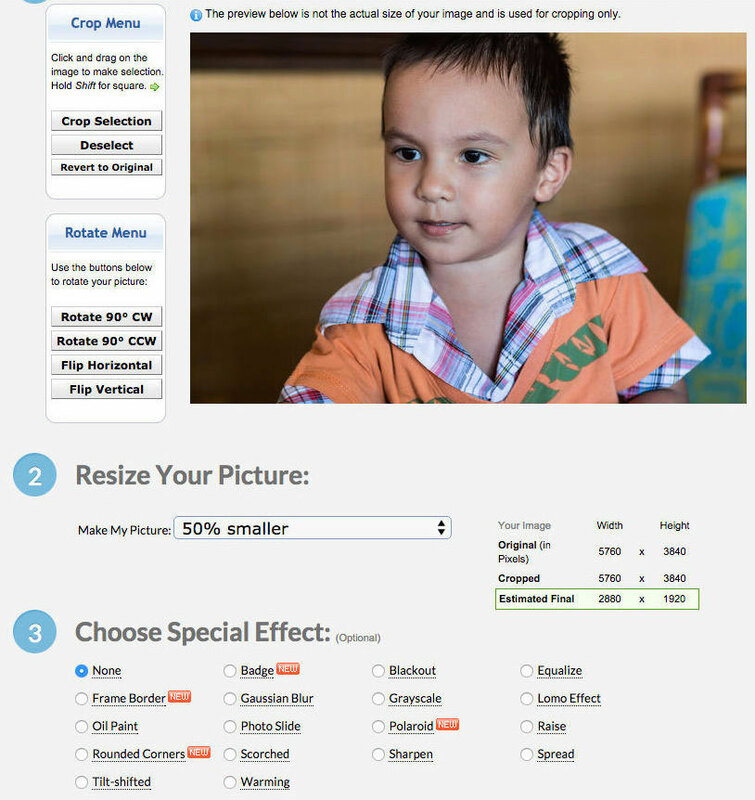 Picresize can also resize your picture by percentage and will show final estimated size. Picresize require that you upload your picture, it has also few photo effects if you need, for example, to have a frame border or do a grayscale. Picresize can save your picture in JPG, PNG, GIF and BMP with some quality adjustment options. 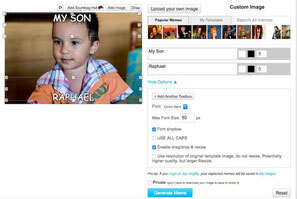 6) Watermark a specialized photo watermark maker. Watermark might be the best out there, if not the best of the best for watermarking your photo or write on your picture! Watermark has a plethora of writing effects for fun, and a plethora of options to watermark your photo, you can even add an image or your logo to watermark your pictures. 7) Rsizr resize, crop and rescale all pictures. Rsizr does not a lot, Rsizer is specialised in resizing, rescaling and cropping pictures, it has a very nice and simple user interface to resize, crop and flip your photos. Rsizer does not need you to upload a picture online to resize or crop it, just use your mouse or trackpad to crop and it's done. 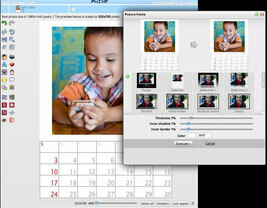 8) PhixR free online calendar editor and photo watermark edit. PhixR has all the text effects, you can even blend a logo to watermark a photo. PhixR has also some interesting functions like the calendar (you will find it in the frames and borders), you chose the month you want to apply and PhixR automatically generate a calendar with the photo. 9) Online text, watermark and image Editor. Online Image Editor: First this free online image editor do not constrain you to a max size (i tried 9000 pixels wide which is the max) but you should know that you will work at ... 100% of the view. It does animated GIF, animation filters, effects, borders and frames, texts and even image in texts! Yes! you read well : i said, image in the text, a must to try as you can see on the picture on the side. 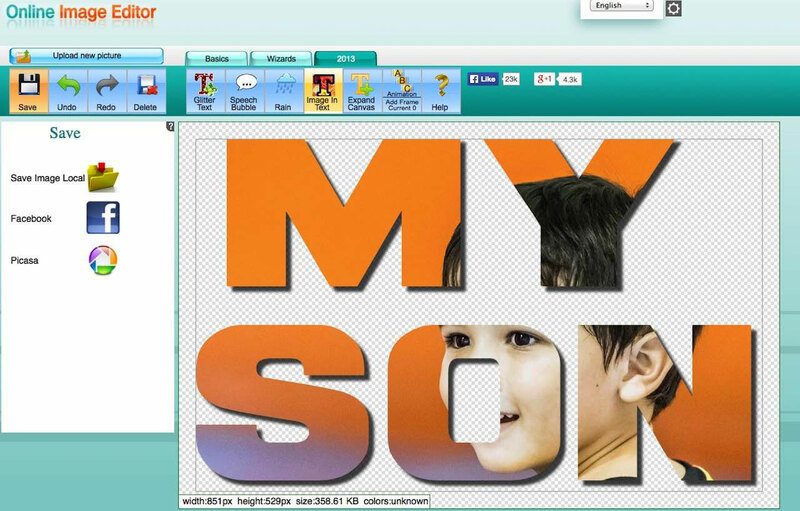 10) Photofunia the free online text effects and calendar maker. PhotoFunia Upload needed, but Photofunia recall when you want to try another effect, so you do not need to upload the same picture for different photo effects. The Photofunia calendar maker is one of the best out there for it's options and quality as high as 2450 pixels, which is very good for a printed calendar. 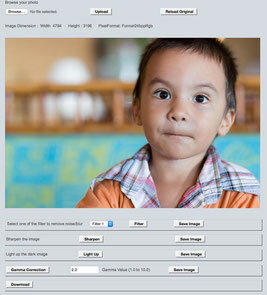 11) ImageBot Online photo editor and special text effects. ImageBot might look a bit confusing in the beginning, but ImageBot is easy to learn and to use all those text effects and different editing functions. ImageBot is perfect to add text and text effects on your image. The number of text effects are quite impressive, for example flame text, shadow on the text and many more options as you can see on the thumbnail. 12) Donesmart a free online text and watermark editor. Donesmart a free online text and watermark editor. 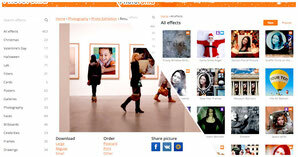 Donesmart is a well featured free online text and photo editor with many options for the text. Donesmart can work with layers when you add some text, allowing you to play with the opacity tool to get some effects on the text or watermark. Other than the text effect, Donesmart has some basic tools to edit your photo and save it at the original size. I was digging around for information on image editors today and came across your resource page.